It is a scam that is hard to stomach for some Uber users. It's called "Vomit Fraud" and according to the Better Business Bureau, it's an actual thing. According to the BBB, riders claim they are being set up by drivers who are filing cleaning fees saying the rider threw up in their car, despite it never happening. The riders are then charged anywhere from $80 to $150 depending on the mess. 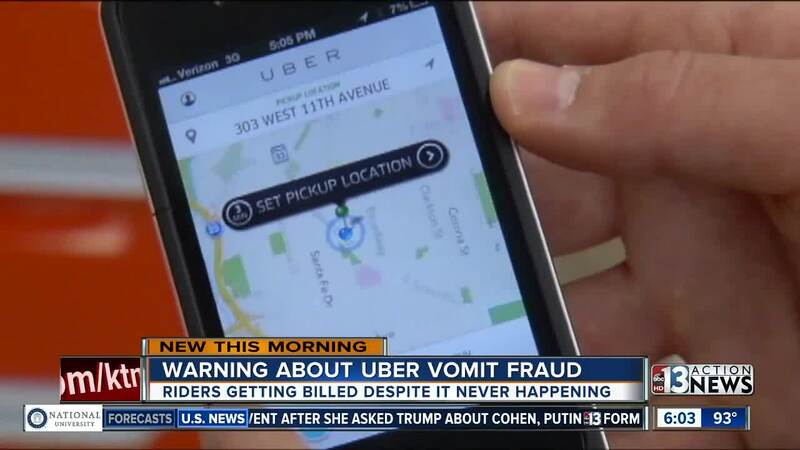 The fraudulent claims were first reported by riders in Miami , who said the drivers went as far as providing staged photos of vomit to Uber. 13 Action News spoke to local Uber riders who were not aware of the scam but did feel like the fees were unfair. "People come and they drink and get drunk in the car but not everybody is throwing up in the car. So if you are charged for something you're not doing it is extremely unfair," said rider Hasim Rahman Jr.
Another rider suggested rideshare companies place bags in their back seats to prevent future messy situations. Uber suggest riders file a claim through their app if they do find fraud on their account. Right now the best way to contact customer service is through the Uber app or email. Uber has a toll-free number that seems to be used for emergencies instead of customer service related claims.